Following summary judgment of invalidity for lack of patentable subject matter the court denied plaintiff's motion for attorney fees under 35 U.S.C. § 285 because defendant's litigation positions were not baseless. "[T]he patent issued after the Supreme Court’s decision in Alice. The patent is presumed valid, 'and this presumption exists at every stage of the litigation.' Defendant also notes that it did not initiate the litigation. In Defendant’s view, it merely defended 'a presumptively valid patent and preserve[d] its counterclaims in an action it did not initiate in a forum it did not choose.' In addition, Defendant correctly points out that post-Alice, the landscape of patent ineligibility under 35 U.S.C. § 101 is unsettled and rapidly evolving. Defendant argues that while it was aware Alice 'would create difficultly[,]' it defended the patent in good faith. On this record, the Court declines to find that the substantive weakness of Defendant’s position was so objectively apparent as to render the case exceptional." The court denied defendant's motion to dismiss on the ground that plaintiff’s MPEG decoder patent encompassed unpatentable subject matter because the asserted claims were not directed to an abstract idea. "[T]he [Alice] step one inquiry may be a complicated matter if only because it is not clear what abstract means in the first place. The step one inquiry is further complicated by the fact that it is not always easy to say what a patent claim is 'directed to.' . . . Unfortunately, the fundamental concept or purpose of a claim can be expressed at varying levels of generality or specificity, which could then impact whether it is directed to an abstract idea (i.e., the more general the purpose, the more likely to be abstract). . . . [T]he purpose of the claims at issue is to decompress digital video using a single memory. That is the gist of the invention at issue. Given this purpose, the Court is satisfied that there is no genuine risk of preempting future research and development – i.e., [plaintiff] is not simply claiming an abstract idea in the attempt to lay claim to a building block of future research and development; the invention has specific configuration, not a broad abstract idea. . . . Because [defendant] has failed to establish that the claims at issue are directed to a patent-ineligible concept, i.e., an abstract idea, the Court need not address step two of Alice which embodies the inventive concept test." The Board granted the patent owner's contingent motion to amend, granting entry of proposed claims 6-10 for original claims 1-5 which had been found unpatentable, because the proposed amended claims were patentable over the prior art of record. "[N]one of the tire/wheel hangers of either [U.S. patent '144], [U.S. patent '690], [U.S. patent '228], or [a European patent application publication] recognize the desire to reduce bending over while handling a heavy object, as required by the claimed method. Instead, they pertain, generally, to hanging a wheel somewhere on a wall or rail, but are silent as to where that somewhere might be, let alone a location conducive to avoiding back injury from lifting the wheel. This is not a matter of simply slapping a known wheel hanger on an automotive lift; rather, it is a matter of taking a known structure and utilizing it in a specific manner on a specific structure for a specific purpose.Thus, we are not persuaded that it would have been obvious to a skilled artisan to affix any one of the known wheel hangers of [the four references] to an automotive lift in the specific manner and for the specific purpose, as required by substitute claim 6." The court granted defendant's motion for attorney fees under 35 U.S.C. § 285 following plaintiff's post-Markman voluntary dismissal because plaintiff's direct infringement claim was baseless. "Notably, in the Complaint, plaintiff alleged that the [patent-in-suit] was 'directed to a portable computer having an integral case.' At the same time, plaintiff alleged that defendant had infringed his patent by selling or manufacturing only portable computer cases. In other words, although plaintiff’s patent was directed toward a computer and an integral case, defendant only manufactured cases. . . . In light of plaintiff’s own construction of the [patent] from the outset of this case, and the known fact that defendant did not manufacture or sell a product that was covered by that construction, the Court is at a loss to explain why plaintiff chose to initiate and then continue litigating his direct patent infringement claim. . . . [T]o the extent plaintiff’s knowledge of defendant’s manufacturing or sale habits was shaky, those habits were made abundantly clear in defendant’s Counterclaim — filed less than four months after the initiation of this case, and nearly a year before plaintiff moved to dismiss the direct patent infringement claim." The court granted defendant's motion to compel draft reports exchanged between plaintiff's experts. "It is clear from [one expert's] testimony that he and [another expert] both reviewed the comments of the other during the course of forming and completing their final expert reports. While the Pretrial Scheduling Order does provide that drafts of expert reports shall not generally be discoverable, the Federal Rules of Civil Procedure also provide that a party is entitled to all the facts and data considered by another party’s expert in forming that expert opinion. At issue here is not an unadulterated expert report draft copy. At issue here are three expert report drafts with editorial comments prepared by a different expert, which each issuing expert reviewed and considered before finalizing their respective expert report. As such, [defendant] is entitled to the comments on the drafts and the portions of the drafts (for context) to which those comments relate." In a final written decision, the Board found claims of a database security patent unpatentable under 35 U.S.C. § 101. "[W]e are persuaded by Petitioner that the claims are directed to the abstract idea of determining whether access to data should be granted based on whether one or more rules are satisfied. We are not persuaded by Patent Owner that the claims are not directed to an abstract idea, because Patent Owner’s argument is based upon elements not required by the claims. Given our construction of 'data portion' and 'database' . . . the claims do not require protection on the data element level based on rules stored in a separate database, where the first database calls out to the second database. Patent Owner’s argument is not commensurate with the scope of the claims." In the quest to identify prior transactions to support damages opinions, experts sometimes push the bounds of comparability. Are litigation-induced licenses comparable to the hypothetical negotiation that would occur in the instant case? What about licensing negotiations that did not produce an agreement, licenses involving different patents or technology, or licenses for patent pools or bundles instead of individual patents? Since 2008, district courts have addressed these and similar questions in 123 decisions, 75 of which were granted or partially granted. To view those decisions, click here. To view all 123 decisions, delete the “Result of Motion” filter at the top of the page. Click “Create Alert” to be notified when a new decision is issued. The court granted defendant's motion to exclude the testimony of plaintiff's damages expert regarding an effective royalty rate of 18-25.4% as unreliable because it relied on a noncomparable litigation verdict. "[Plaintiff's expert] wholly failed to address whether the [l]itigation verdict is comparable to the hypothetical license in this case. [He] did not discuss the technology involved in that case, nor did he account for the very different economic circumstances that often surround litigation. Because [plaintiff's expert] did not establish that the [l]itigation verdict is comparable to the hypothetical license here before using it to support his reasonable royalty opinion, his testimony on that issue must be excluded." Docket Navigator will be speaking at the MIP PTAB Forum 2016, hosted by Managing Intellectual Property, in New York on May 12, 2016. Topics include: the latest trends and developments in PTAB trials; preparing for the rule changes in 2016; PTAB appeals before CAFC; a deep dive into key PTAB statistics; and more. The MIP PTAB Forum 2016 is free to attend for in-house counsel. Docket Navigator law firm subscribers will receive a 20% discount. For more information, please click here. The court granted defendant's motion for judgment on the pleadings that plaintiff's interactive map patent was invalid for lack of patentable subject matter due collateral estoppel and rejected plaintiff's argument that its pending motion for voluntary dismissal mooted defendant's motion. "The Court enjoys broad discretion in determining whether dismissal pursuant to Rule 41(a)(2) is appropriate. This discretion is not unfettered, however. The Eleventh Circuit has explained, '[i]n most cases, a voluntary dismissal should be granted unless the defendant will suffer clear legal prejudice, other than the mere prospect of a subsequent lawsuit, as a result.' The key question, then, is whether the defendant would 'lose any substantial right by the dismissal.'. . . Defendant may suffer such a loss if Plaintiff’s voluntary dismissal was granted over Defendant’s objection. . . . Without a . . . covenant [not to sue] accompanying the requested dismissal here, the Court believes dismissing this action pursuant to Rule 41(a)(2) might prohibit Defendant from achieving prevailing party status under 35 U.S.C. § 285." The court awarded a defendant $3.4 million in attorney fees under 35 U.S.C. § 285 and allowed it to recover $235,780 in pre-suit fees. "[Defendant's] billing entries reflect that it engaged counsel during this time to perform an analysis of Plaintiff’s patents and of potential damages. [Defendant] states that it 'foresaw litigation' based on a letter from Plaintiff indicating that “[Plaintiff] believes that it is now appropriate for licensing discussion with [defendant] to re-commence' and that 'it appears that a substantial portion of [defendant's] drug discovery efforts for Alzheimer’s Disease are entirely reliant on the unauthorized use of [Plaintiff’s] patented technology.' As [defendant] reasonably anticipated that this litigation would occur, its reasonable fees incurred prior to the initiation of this case are recoverable." Since inception, the PTAB has issued 345 institution decisions in CBM review proceedings, 283 of which specifically addressed whether the challenged patent was eligible for CBM review as containing at least one claim directed to a financial product or service. Of those, 69 resulted in a decision to deny institution of all claims and 214 granted institution as to one or more claims. To view the decisions denying institution, click here. To be notified when a new decision is issued, click “Create Alert” at the bottom of the page. To view all 283 decisions, delete the “Result of motion: Denied” filter at the top of the page. The Board denied institution of covered business method review of a patent directed to soliciting feedback from website users under 35 U.S.C. § 101, because the petition did not establish that the ’805 patent qualified as a “covered business method patent” under § 18(d)(1) of the AIA. "[Petitioner] argues that the claimed invention is directed to a financial product or service because the specification states that the claimed invention may be used in connection with websites that conduct 'commercial transactions.' But . . . the relevant inquiry is on the claims and whether they are directed to a financial product or service. Here, the claims are devoid of any terms that could be reasonably argued as rooted in the financial sector or limited to a monetary transaction. Instead, the claims recite a software capability of general utility that crosses many sectors, commercial and non-commercial alike." The court granted defendants' motion for summary judgment that plaintiff was collaterally estopped from claiming an earlier invention date for one of its internet security patents. 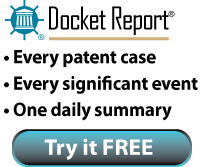 "Defendants rely on [an earlier] order in [one of plaintiff's other cases] which held that the 'presumptive invention date of the [patent-in-suit] is its filing date,' . . . as Plaintiff had not met its burden to show that the [patent] has a priority date of [13 months earlier]. . . . There is no question that Plaintiff was a party in the previous action, that the issue was actually litigated, and that Plaintiff had a 'full and fair opportunity to litigate.' Plaintiff’s argument that collateral estoppel does not apply because the priority date determination in [prior case] was not essential to the final judgment lacks merit. It is of no consequence that the determination did not affect the jury’s validity finding, given that the determination was made following a bench trial at which the priority date for the [patent] was one of five issues decided." The court denied defendant's motion for summary judgment that the asserted claims of plaintiff’s network security patents encompassed unpatentable subject matter and found that the claims were not directed toward an abstract idea. "[Defendant] argues that the claims are directed to the abstract idea 'of monitoring and analyzing data from multiple sources to detect broader patterns of suspicious activity,' which is 'a fundamental building block of intelligence gathering and network security.' [Defendant] analogizes this idea to a number of spy and security gathering endeavors, including 'networks [employed by] . . . both sides during the Revolutionary War' . . . . That [defendant] can simplify the invention enough to find a human counterpart (or argue that a human could somehow perform the steps of the method) does not suffice to make the concept abstract, as '[a]t some level, "all inventions . . . embody, use, reflect, rest upon, or apply laws of nature, natural phenomena, or abstract ideas."' The patents address the vulnerability of computer networks' 'interoperability and sophisticated integration of technology' to attack. The claims at bar are, therefore, more complex than 'merely recit[ing] the performance of some business practice known from the pre-Internet world along with the requirement to perform it on the Internet,' and are better understood as being 'necessarily rooted in computer technology in order to overcome a problem specifically arising in the realm of computer networks.'" The court granted defendant's motion for relief from the jury's finding of willful infringement because defendant presented a substantial question of invalidity. "At trial, [defendant] presented evidence of invalidity due to obviousness as to all ten of the patents-in-suit, as well as anticipation evidence as to six of the ten patents. The Court denied [plaintiff's] mid-trial Rule 50(a) Motion as to the majority of [defendant's] invalidity defenses, granting it only as to the anticipation of two of the patents. In so ruling, the Court found that [defendant] had presented sufficient evidence for a reasonable jury to find in its favor on its claim that each of the patents-in-suit was invalid as obvious. [Defendant's] invalidity arguments, though ultimately found unpersuasive by the jury, were supported by expert testimony from [two experts] who opined as to each claim and each patent at issue. . . . This finding is further supported by the proceedings brought with respect to [two] patents before the [PTAB], which resulted in a finding of invalidity as to [one] patent, and a hearing as to the possible invalidity of the [other] patent. While this evidence was not before the jury, it bolsters the Court’s present finding that [defendant's] invalidity defenses met the minimal standard of objective reasonableness, at least as to some of [plaintiff's] patents." The court denied defendant's motion for attorney fees under 35 U.S.C. § 285 where the patent owner filed for a cancellation of claims during CBM review while plaintiff's motion to dismiss was pending. "Defendant argues that bad faith can be inferred from Plaintiff’s decision to cease defending the [patent-in-suit] before the PTAB and [the patent owner's] request for adverse judgment to the PTAB. Defendant points to the proximity of Plaintiff’s and [the patent owner's] actions to the closing of the PTAB’s argument deadline as evidence that Plaintiff was motivated by a bad faith purpose of avoiding litigation on the merits. However, Plaintiff has presented to the Court a business explanation for terminating its defense before the PTAB -- that any potential damages would be low due to Defendant’s low revenue and the [patent’s] imminent expiration date. This explanation weighs against a finding of bad faith." The court granted defendant's motion to dismiss because the asserted claims of plaintiff’s discount redemption patent encompassed unpatentable subject matter and found that the claims were directed toward an abstract idea. "The Court finds claim 11 is directed to the abstract idea of a 'membership discount program' on a network. . . . [Plaintiff] asserts [defendant] has overstated the breadth of the claim because, at the time of invention, 'membership discount programs were not widely implemented.' [Plaintiff] notes by way of background that claim 11 would not have covered the 'membership discount programs” that existed before the patent. . . . The Supreme Court has indicated that the prevalence of an abstract idea does not factor into a patent-eligibility analysis. . . . Furthermore, the Court finds that describing two abstract ideas in connection with each other — 'collecting customer information' and 'membership discount programs' — does not cause either abstract idea to then become a concrete thing." The court denied defendant's motion for new trial due to an inconsistent jury verdict because defendant waived the issue and the court lacked jurisdiction to sua sponte order a new trial. "The verdict form in this case is best categorized as a general verdict form with special questions. Because [defendant] did not raise the issue of inconsistency before the jury was dismissed, the issue has been waived. This waiver is unfortunate because of the obvious and irreconcilable inconsistency of some portions of the jury verdict. . . . The jury ruled that dependent claims of the [patents-in-suit] were infringed, but that independent claims were not infringed. This is legally unsupportable. . . . [Defendant's] waiver places the court in the uncomfortable position of allowing a logically incomprehensible verdict to stand. Ideally, the court would order a new trial in spite of the waiver. . . . But the court's discretion is limited to a window of 28 days after the entry of judgment. After that time frame has passed, the court no longer has the authority to grant a new trial on its own initiative. The 28-day window has long passed, and the court cannot exceed its jurisdictional authority. The jury verdict, though flawed, must stand." The court granted defendant's motion to dismiss because the asserted claims of plaintiff’s patent for creating and filling out computerized forms encompassed unpatentable subject matter and found that one asserted system claim was ineligible for patent protection because it lacked a tangible form. "[Plaintiff] argues that Claim 1 is directed to specific components that, when considered as a whole, describe a narrowly-drawn, complete program for designing, creating, and filling out computerized forms. . . . [A]s a system claim, the system must exist in some physical, tangible form to qualify as subject-matter eligible under § 101. An intangible system claim is ineligible for patent protection. . . . Claim 1 is not directed to any tangible or physical component, form, or structure. Claim 1 is directed to abstract files, data, and programs in an intangible state, disconnected from the physical world in any way. The system claim does not 'claim any tangible part of the digital processing system' through which the files, data, and programs are stored, processed, or viewed. The preamble of Claim 1 does not describe a tangible medium, either, such that it could 'give life' to the claim." The court awarded defendant $1 million in attorney fees under 35 U.S.C. § 285 (approximately half the requested fees) following the denial of plaintiff's appeal of summary judgment of noninfringement and invalidity. "[T]he court rejects plaintiff's contention that defendant may only be compensated for its expenses related to the § 101 issue. As plaintiff has conceded, that area of law was at the time (and even today) evolving. Judicial economy (not defendant) is responsible for the court's decision not to reach additional issues once defendant succeeded on this issue at the summary judgment phase. . . . Taking into account that patent cases are complex and patent litigation is an expensive proposition, nevertheless, the court will award attorney fees of $1,000,000 to account for the fact that plaintiff's ever changing litigation strategies (including its claim construction positions) created a tortuous path to resolution. . . . [T]he court denies defendant's motion for additional fees, as such appeal, was reasonable and not exceptional." The court granted defendant's motion to dismiss because the asserted claims of plaintiff’s job candidate evaluation patent encompassed unpatentable subject matter and found that the claims were directed toward an abstract idea. "The [patent-in-suit] has a very simple premise: anonymously surveying references and compiling the survey data before interviewing applicants will help companies only interview the best applicants. The [patent] is 'trying to achieve,' the abstract idea of reference checking job applicants. . . . In this case, the claims, alone and in combination, could all be completed by the human mind. A pen and paper version of the claimed method would not be particularly efficient, but it could be completed." In a final written decision, the Board found a claim of a portable data storage device patent unpatentable under 35 U.S.C. § 101. "[T]he ’458 patent discusses addressing recording industry concerns of data pirates offering unauthorized access to widely available compressed audio recordings. The ’458 patent proposes to solve this problem by restricting access to data on a device based upon satisfaction of use rules linked to payment data. As Petitioner notes, the ’458 patent makes clear that the claimed subject matter is directed to paying for data and providing access to data. Although the specification discusses data piracy on the Internet, the challenged claims are not limited to the Internet. The underlying concept of the challenged claims, particularly when viewed in light of the ’458 patent specification, is controlling access to content, as Petitioner contends. As discussed further below, this is a fundamental economic practice long in existence in commerce."